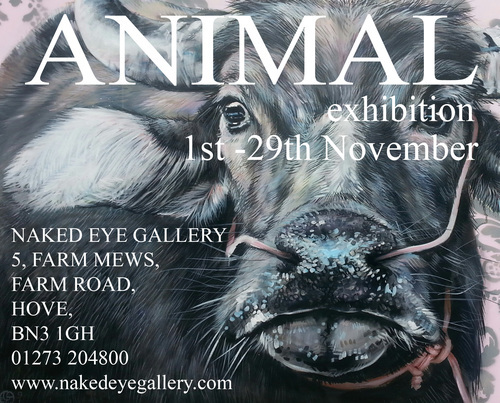 Between the 1st-29th November, the Naked Eye Gallery will be celebrating the natural world from a zoological perspective in the ANIMAL Exhibition. The exhibition is a varied and dynamic blend of the photo real, the surreal and 3D work by renowned and respected artists Sara Abbott, Dylan Floyd, Susan Taylor, Lauren Alderslade and 3D ceramicist James Fenner amongst others. Their pieces range from exotic beasts and extraordinary hybrid creatures to the quintessential English small mammals. Each and every artist involved in the exhibition have created an impressive body of work, all uniquely different and all completely charming in their own right. The common element between them is that their work is fuelled by their passion for animals. This entry was posted on October 17, 2015 by mptask in Hove, Naked Eye, November 2015 and tagged animals, art, art exhibition, Brighton and Hove, ceramics, Dylan Floyd, Hove, James Fenner, Lauren Alderslade, Naked Eye Gallery, painting, Sara Abbott, sculpture, Susan Taylor.